The problem of protein folding is a complex one that the citizen science movement has tackled for many years now. For those not already familiar, proteins are highly complex molecules used for a wide variety of functions. If DNA is the blueprint of life, and amino acids are the building blocks, proteins are the full structures designed by DNA and made up of the 22 amino acids standard in humans. But each protein can have hundreds or thousands of different amino acids and can take on a world of different structures. Since these structures are a big part of how a protein works, understanding protein shapes (or "protein-folding") becomes very important. 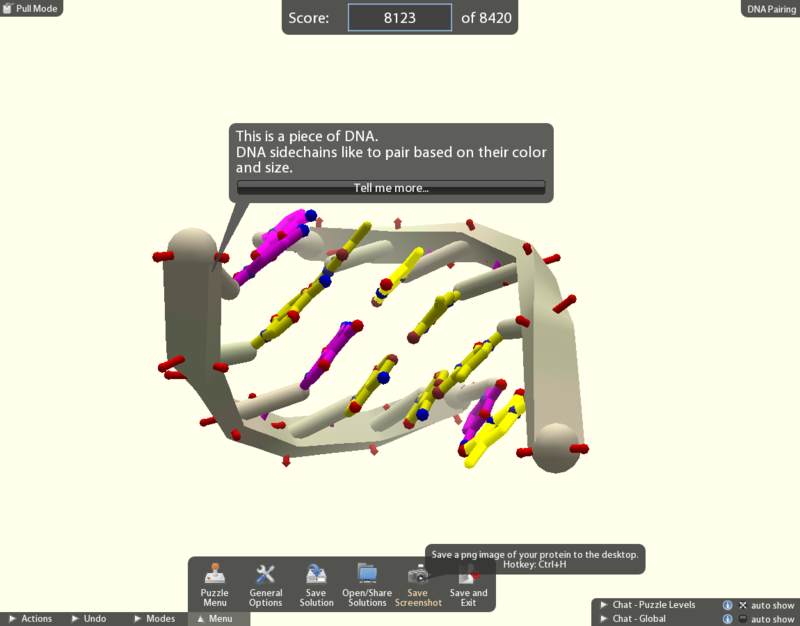 As a quick illustration, in this first example from the game tutorial you can see a DNA helix (the familiar shape seen on TV shows like CSI) and how the strands bond together. This same ability DNA pairs use to bond can also be used to attach a DNA strand to a protein. In this example you can see the protein, the DNA strand, and the striped blue "Hydrogen Bond" that connects the two structures together. FoldIt asks users to build on these concepts and apply it toward increasingly complex problems. Previous efforts asked users to lend their computers to massive supercomputing projects in attempts to try every possible structure and calculate the best one. A related project by some of the FoldIt scientists called Rosetta@Home aimed to do just that, and we will look at those efforts again in the near future. 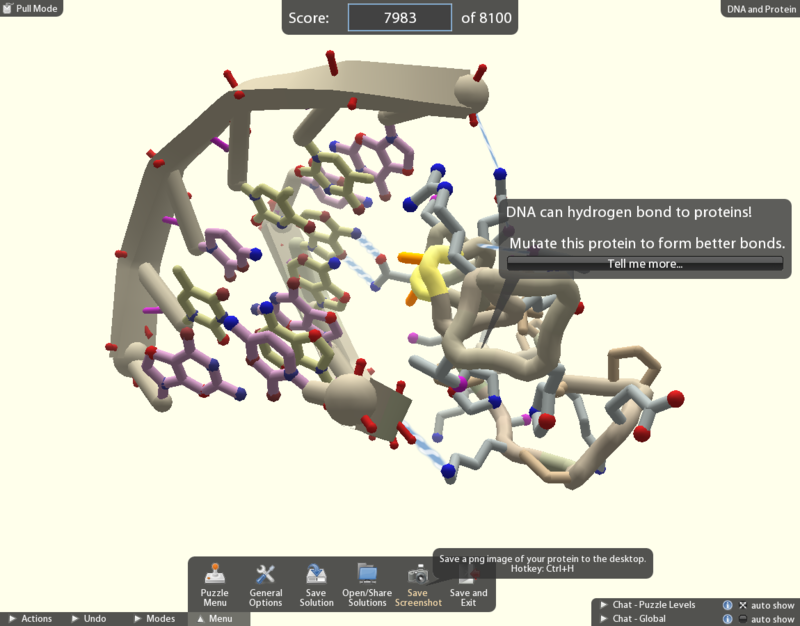 But now the makers of FoldIt have designed an interactive game that let's individuals or teams compete to solve these real-life biochemistry problems. This is what we're looking at today. Visit the FoldIt web site and register a new account. Download the appropriate Windows 7, Mac, or Linux version of the program and install to your home computer or laptop. Start up the FoldIt program and follow the in-game tutorial. It will guide you through folding 27 increasingly complext proteins, teaching about the program and the principles of protein-folding in each step. By the time you finish not only will the interface be familiar, but so will the science behind it. Work your way throught the "Novice" levels of proteins to practice your skills. Here you are asked to provide solutions for proteins whose structure is already known, and let's you compare your results to the true answer found in nature. Finally, you are ready for the Grand Challenges tackling full proteins that have not been characterized. You can do this alone or as a team, saving your work at every step. Or you can act as an "Evolver" that takes a partial solution another person created and add your own improvements. People aren't required to provide others access to partial solutions but the option is available for those who want work collectively. One of the many beauties of this project is its ability to show how molecules attract/repel each other and how they can be molded together. After a while, you too can be a master of changing alignments, twisting sheets, rotating helices, hiding hydrophilics, and other tricks used to make the pieces fit. So stop waiting and get started. And have FUN! After all, it is a game.